The third exhibition of Seb Chua, ‘Hemispheres,’ at Art Asia Gallery, which opens on Saturday, August 15 2009, represents the latest creations of the next sculpture generation. The works are traditional in their reticent style and often uncanny in effect. His exquisite, abstruse sculptures, ‘Cocoon’, ‘Tower’ and Sacred Heart’—room sculptures in cast bronze—achieve a kind of art that relives the ambitions of modernity and its modes of expression. The rousing point basically is about the changes that one sculptor undertakes in his style or in his lifestyle in order to sustain a career. When Seb Chua went from sculpture to painting, it was apparent that he was looking for a way to contain his aggressive thought to things. Now, he says there is another counterpoint to thought and reason. “I became a sculptor because it allowed me to express. It allowed me to express what I was ashamed to express before,” says Seb. His paintings are no different in purpose except that in painting, he is able to express more through the use of color. This carousing on emotion and thought registers most pungently in the paintings ‘Transition’ and ‘Landscape of my mind’. They are reflections of elegant thinking—as signs, it seems, of a conscious, unsullied whirl of transcendence. The interaction between the seemingly contrasting fields of reason and emotion among others is at the core of the exhibit. Although Seb has been involved with immense and ambitious projects ever since his last solo show, the works in Hemispheres still arguably explore the same interests in small-scale objects strewn across the gallery. The crucial question has to do not with their actual physical scale, but with their role in finding a critical place of resistance that, for an artist today, is difficult enough to locate, let alone occupy. Recalling a conversation with Seb in which he likened his artistic process to what he called a ‘sanctuary,’ one draws the conclusion that as an artist, he is forced to live a double-life, between the business office and the working studio. There is another dimension to Seb’s aesthetics too, namely, the temporal complementing the spatial and emphasized by a word Seb has often used in reference to his work: exploration. You can feel this naturally in his gestural paintings. Seb is interested more in dispersal than in the limits of figure as such, and in the disintegration not only of structures but also of networks and understanding. This is induced in both his painting and sculpture through the discrete lines that look as if they have been directed by the pressure of elements like wind or water, but also, more broadly, to the torrents of his own inflection.Specific meanings and associations are further worn away as works are viewed, documented, and interpreted. His sculpture’s organic forms are a function of synthetic, industrially produced materials. Take for example, “True Treasures,” a touching sculptural embodiment in machined and glossily painted cast bronze. "The Journey” is mainly figurative, also cast in bronze, refined mother and child. . Its incisive beauty reflects the artist’s ongoing fascination with the integration of realism and abstraction in Classic Greek sculpture. The swan-like figure of ‘Sacred Heart’ invites us to look in. In every work we are reminded that the show, more than just presenting the differences and similarities between halves of a sphere and halves of his brain is also about transition and the paths they create in the mind—change as a recurring state of nature, the past, and the soul. 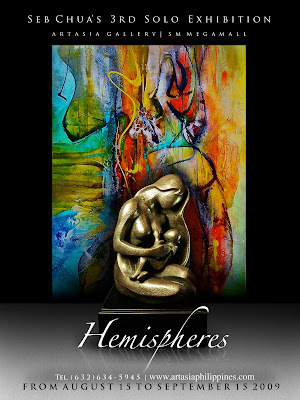 Hemispheres will run until September 15, 2009. Art Asia Gallery is located at the 4th Floor, Artwalk, SM Megamall Building-A in Mandaluyong City. You can contact the gallery at (632) 634-5945 or email curator@artasiaphilippines.com. Visit also their website at http://artasiaphilippines.com. wow kuya ang ganda naman ng painting na yan.